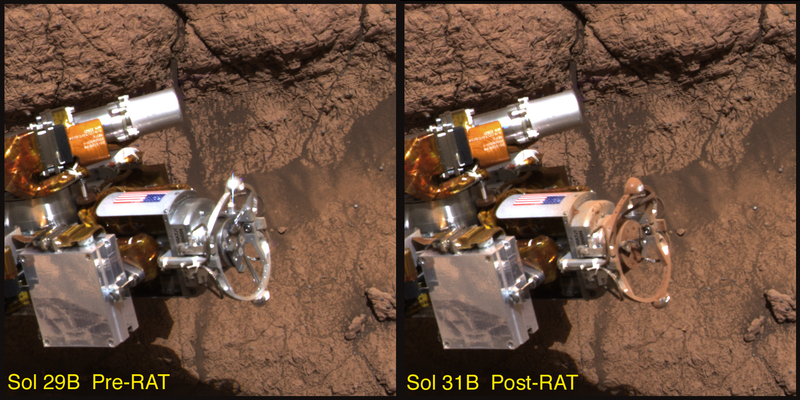 This image taken by the Mars Exploration Rover Opportunity's panoramic camera shows the rover's rock abrasion tool before and after it ground into a rock at the region dubbed "El Capitan." Color and spectral properties of the dust show that it many contain some fine-grained hematite. 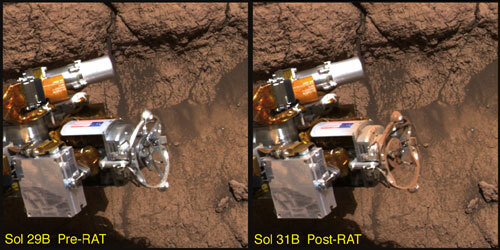 The image on the left was taken on the 29th martian day, or sol, of the rover's mission, and the image on the right on the 31st sol. Both images were acquired using the camera's red, green and blue filters. way cool....ive always been a big fan of space exploration...its something we have to do .